The measurement of motility changes when parasites are exposed to new compounds has proven to be useful for novel anthelmintic discovery. Many motile parasites, ranging from 200um to few millimeters in size, are easily detected with our WMicrotracker system. Below you’ll find a procedure example. In this experiment we can observe the sensitivity and linearity for detection of Echinococcus granulosus protoscoleces. As observed in the plot, movement can be detected when a population’s bigger than 45 organisms/well is employed. Linear range is observed from 50 to 200 organisms/well. (1) Obtain fresh cultures of E.granulosus from porcine or bovine tissue. (2)Count #organisms in 10ul, and adjust volume to get [1-20 parasites/10ul]. 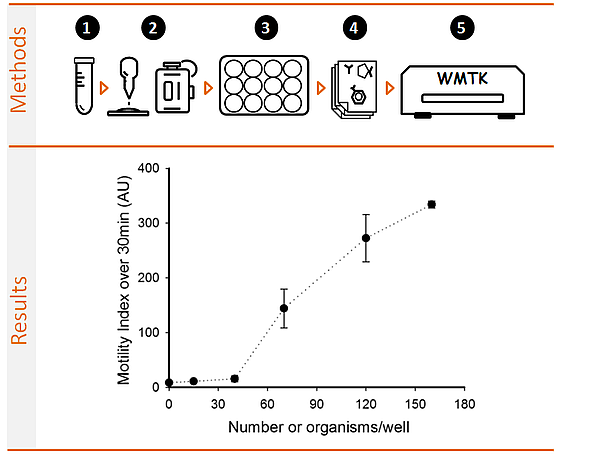 (4)Transfer 100 ul of organism solution to “U-bottom” 96 well microplates using multichannel pipette. (optional :)Let them rest for 1h and measure basal activity using WMicrotracker. (4)Add 11 ul of a 10x concentrated solution of chemicals to test. (5)Register parasite activity using WMicrotracker.